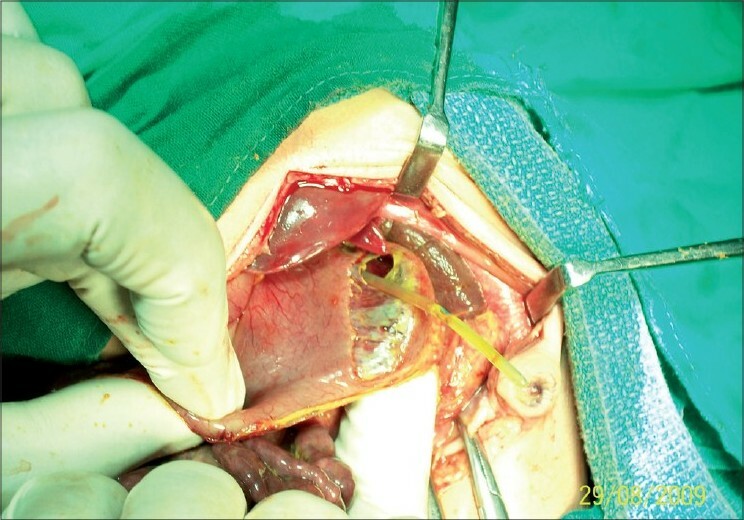 Neonatal gastric perforation is an unusual surgical emergency. The high mortality rate reflects to a certain extent the precariousness of the neonatal period, but the process evolves so rapidly that prompt diagnosis is necessary if improved survival rates are to be achieved. Many theories have been proposed for the pathogenesis of gastric perforation, but the aetiology is still unknown. Here, we present three cases of neonatal gastric perforation treated in our hospital in last 5 years. A 3-day-old full term baby, weighing 2605 g, was admitted with history of abdominal distention. Examination revealed a lethargic newborn with marked abdominal distention. Bowel sounds were absent. Abdominal X-ray revealed huge free intraperitoneal air [Figure 1]. The provisional diagnosis was perforative peritonitis. On exploration, after opening the lesser sac there was a 2 cm Χ 1.5 cm perforation seen on the posterior wall along the greater curvature, with inflammatory exudates all over the abdominal cavity [Figure 2]. Primary repair was done in two layers and abdomen was closed. A drain was left in place [Figure 3]. Postoperative period was uneventful and baby was discharged on 12 th postoperative day. Histopathology of the margin of perforation area revealed nonspecific inflammation. A 2-day-old premature girl with 33 weeks gestational age, weighing 2105 g at birth, was admitted. She had abdominal distension, respiratory distress, cyanosis and hypoxaemia; assisted ventilation was applied. We performed an abdominal radiograph which confirmed the presence of massive pneumoperitoneum. 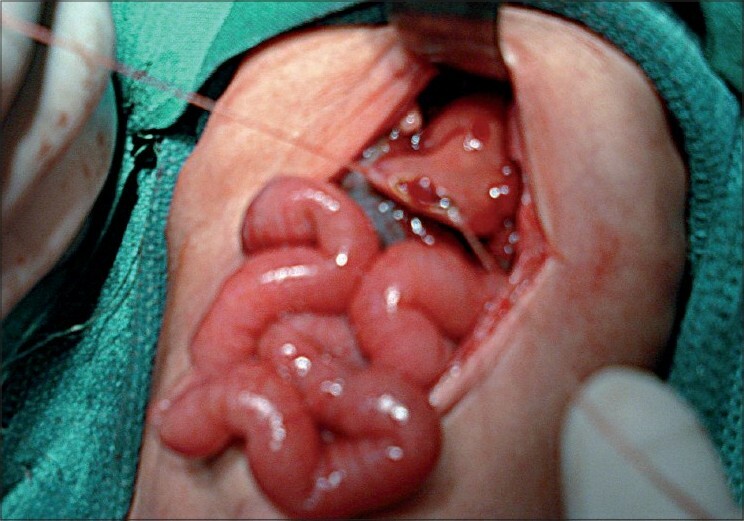 Laparotomy revealed 2 cm Χ 2 cm gastric perforation located over the anterior wall of stomach along the greater curvature of the stomach, with extensive necrosis of the rims [Figure 4]. Primary repair was done in two layers and abdomen was closed. A drain was left in place [Figure 5]. The baby expired 14 hours after operation. Histopathology of the margins revealed acute nonspecific inflammation. Cause of death was prematurity with septicaemia. A 2-day-old full term boy, weighing 3105 g, was admitted with history of abdominal distention, fever and rapid shallow breathing. Examination revealed abdominal distention with signs of dehydration. On abdominal X-ray, there was free intraperitoneal air. 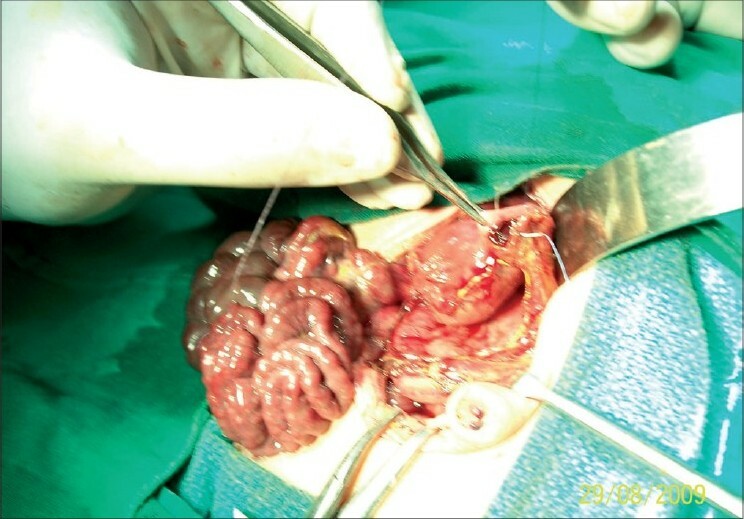 On exploratory laparotomy, there was 1 cm Χ 1 cm perforation seen on the posterior wall along the greater curvature. Primary repair was done in two layers and abdomen was closed. A drain was left in place. Baby expired 6 hours after surgery. Histopathology of the margin of perforation area revealed nonspecific inflammation. The cause of death was septicaemia with respiratory failure secondary to peritonitis. The most common radiographic finding of gastric perforation is pneumoperitoneum which was seen in our cases. 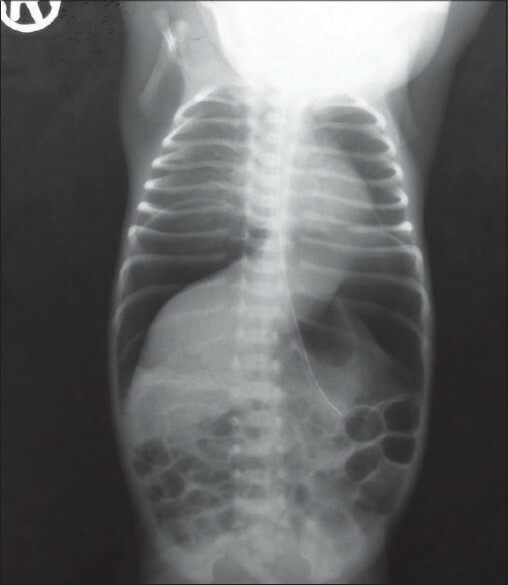 Because of the large size and proximal nature of perforation, these infants may have rapidly progressive pneumoperitoneum with associated cardiopulmonary compromise. Due to the associated problems of sepsis and respiratory failure often found in premature infants, mortality rates of gastric perforation are high, ranging from 45% to 58%. For better outcome, interval between the onset of symptoms and start of definitive therapy should be minimised. We thank Dr. H.R. Tata, Professor and Head, Department of Surgery, Krishna Institute of Medical Sciences, Deemed University, Karad, for advice and permitting this publication. 1. Durham EC, Goldenstein RM. Rupture of the stomach in newborn infants. J Pediatr 1934;4:44. Cited Siebold: Heber Geschwurbildungen des Gastro - Duodenal-Tractus in Kindesalter. Ergebn. inn.Med.u.Kinderh,1919;16:302. 2. Grosfeld JL, Molinari F, Chaet M, Engum SA, West KW, Rescorla FJ, et al. 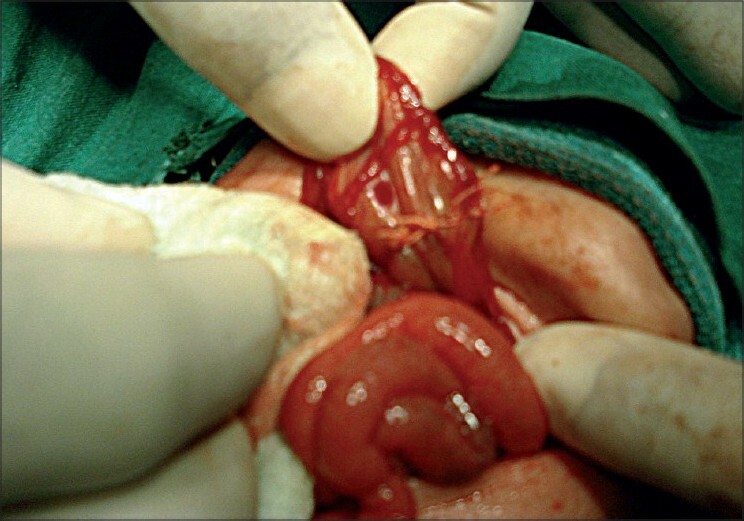 Gastrointestinal perforation and peritonitis in infants and children: Experience with 179 cases over ten years. Surgery 1996;120:650-6. 3. Holcomb GW 3 rd . Survival after gastrointestinal perforation from esophageal atresia and tracheosophageal fistula. J Pediatr Surg 1993;28:1532-5. 4. Ryckman FC. Selected anomalies and intestinal obstruction. In: Avery A, Fanarof AA, Richard J, Martin RJ, editors. Neonatal perinatal medicine diseases of the fetus and infant. 7 th ed. USA: Mosby; 2002. p. 1283. 5. Haddock G, Wesson DE. Congenital anomalies. In: Walker WA, Durie PR, Hamilton JR, Walker-Smith JA, Watkins JB, editors. Pediatric gastrointestinal disease. 3 rd ed. Canada: BC Decker;2000. p. 379-86. 6. Behrman RE, Kliegman RM, Jenson HB. Nelson textbook of pediatrics. In: Stoll BJ, Kleigman RM, editors. Digestive system disorders. 17 th ed. USA: Sannders; 2004. p. 590-1. 8. Rosser SB, Clark CH, Elechi EN. Spontaneous neonatal gastric perforation. J Pediatr Surg 1982;17:390-4. Adhisivam, B., Femitha, P., Joy, R., Prasadkumar, P., Shruthi, B.K., Gane, B.D., Bhat, V.
# Kella, N., Surahio, A.R., Soomro, B.A., Rathi, P.K., Qureshi, M.A.